Too much compression isn't a good thing – listen with care! 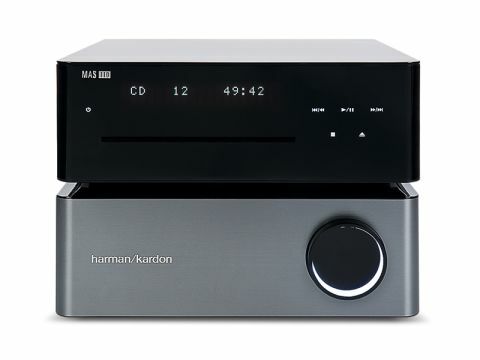 At an attractive price (including loudspeakers, which we didn't include in the review though a brief listen suggests they're decent), the Harman/Kardon MAS110 system looks rather futuristic, with its shiny black finish unspoiled by buttons or other such fripperies. It shows fingerprints, but a quick wipe sees things right. Although quite a lot of functions are in fact banished to the remote, including source selection, the front panel of the CD player does at least have transport controls, touch-sensitive 'buttons' which light up when power is applied, while the amp has a volume control. Actually the 'CD player' is also the preamp part, but no, you can't mix and match the parts as they share a power supply and the only input to the amp is via the multi-way lead. The light weight of the units suggests, correctly, that power supplies are switch-mode, and the power amp is a switching design, too. The CD transport is a slot-loader, while other features include FM and DAB radio (including DAB+, apparently, not that there are any transmissions yet), USB inputs at the rear and the side, digital inputs, and even a phono input, a real rarity on such systems. A matching iPod dock, 'The Bridge', is included. The power amp unit stays impressively cool in operation at any output level, suggesting highly efficient amplification and power supplies. It has a rather similar overload protection mechanism to some recent Cambridge Audio amps, in that it won't let the gain increase beyond a safe level, so you can't really clip it in normal use. Lively and well integrated, our listeners thought, though not the most detailed of the group. It lets the music flow well and gives a good sense of style in pretty much any kind of music, from baroque to soul. Tonally it has good, weighty bass which extends well, while treble is open and natural, never becoming harsh. Just occasionally, the treble may seem a little too polite, and one listener commented that the sound in a couple of tracks could have used some more bite, but that's surely preferable to the opposite. In multi-layered music it's easy to follow the progress of each element, even though analytical resolution escapes these units (hardly surprising given the price). This is largely down to the sound's fluid quality which makes the most of melodic ebb and flow, but there is also some decent resolution in evidence and it's always a pleasant and involving listen. FM radio seems good, and the very civilised treble helps make the most of DAB and MP3 tracks (from iPod or USB stick). The phono stage is fine though a little muffled.